Graphical user interface-based fleet management information systems are 20 years old. You are using yours for more than just record keeping, right? 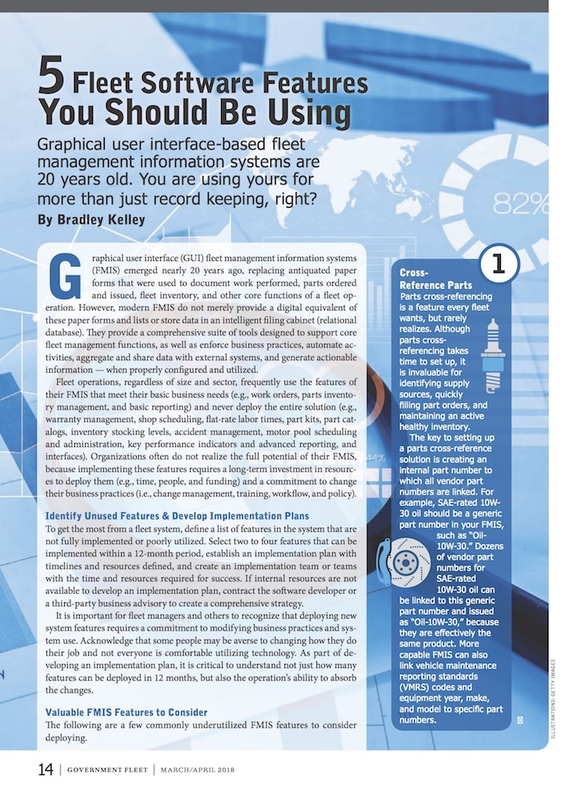 Graphical user interface (GUI) fleet management information systems (FMIS) emerged nearly 20 years ago, replacing antiquated paper forms that were used to document work performed, parts ordered and issued, fleet inventory, and other core functions of a fleet operation. However, modern FMIS do not merely provide a digital equivalent of these paper forms and lists or store data in an intelligent filing cabinet (relational database). They provide a comprehensive suite of tools designed to support core fleet management functions, as well as enforce business practices, automate activities, aggregate and share data with external systems, and generate actionable information — when properly configured and utilized.